The Vietnamese Communist Party remains firmly in power, despite rising public discontent over the lack of personal freedom, corruption in government and land seizures by the administration. The authorities are aware of the risk this poses and are trying to combat corruption and increase social spending. Within the communist party there seems to be an on-going struggle between hardliners and officials more inclined to economic reform. Externally, the territorial clash with China over conflicting claims in the South China Sea escalated in May 2014, when China deployed a drilling rig in waters claimed by Vietnam. This led to confrontation at sea between rival vessels and violent anti-Chinese protests in Vietnam. After the removal of the oil rig in July, both sides began talks to de-escalate the situation and finally agreed in late October to use an existing border dispute mechanism to find a solution to the territorial dispute. However, it is unlikely that this conflict will be resolved anytime soon. To counter growing Chinese assertiveness in the South China Sea, Vietnam is keen to improve its political and security cooperation with the US and Japan. However, Vietnam lacks the military capability to pose a serious challenge to Chinese actions, and its manufacturing sector depends heavily on imported Chinese raw materials. Moreover, given the ideological similarities of the regimes in both countries, there is still a strong pro-China faction within Vietnam’s Communist Party. Vietnam is slowly moving from a centralised communist economy to a system of market-socialism. Economic reform to achieve this aim (given the name ‘doi moi’ when initiated in 1986) has resulted in relatively high economic growth, but growth has decelerated since the 2008 financial crisis and is not expected to return to pre-crisis levels of more than 8% in the near future. Vietnam’s economy is extremely export-driven, specialising in textiles and footwear; making it vulnerable to deteriorating demand for those goods. 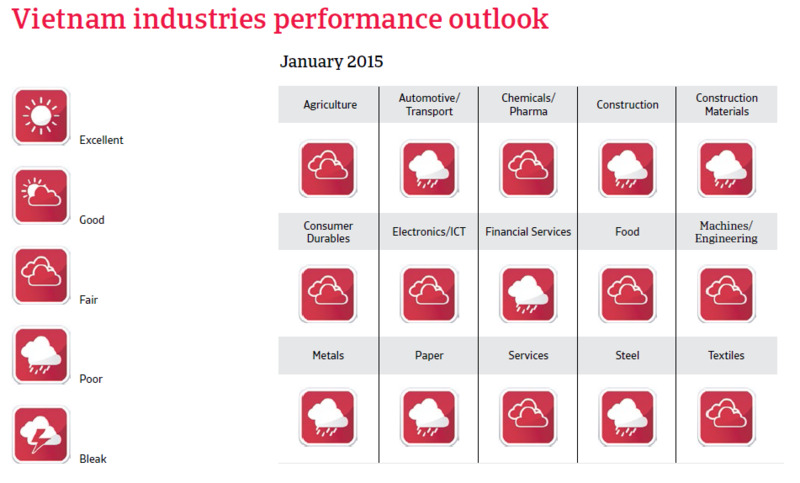 The economy is shifting towards higher valueadded sectors such as electronics. Since 2013, the government has prioritised monetary stability over economic growth. 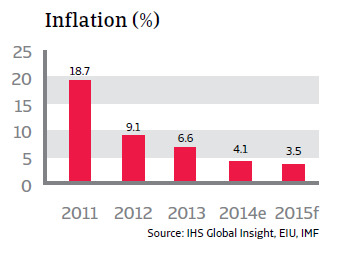 The persistently high inflation seen over the last couple of years (with double-digit rates in 2010 and 2011) has finally decreased (expected to be 3.5% in 2015), and in March 2014 the Central Bank lowered the benchmark interest rate by 50 basis points, to 6.5%. 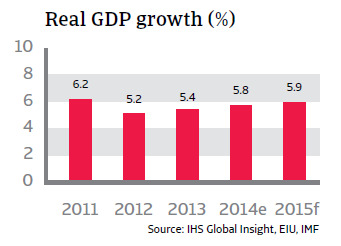 With 5.8% growth expected for 2014, GDP is forecast to grow 5.9% in 2015. Public finances remain an issue due to persistent fiscal deficits: the result of lax fiscal discipline and expenditure on infrastructure and social welfare. Public debt amounts to more than 55% of GDP. Reform of inefficient state-owned enterprises and the financial sector are essential. Other structural challenges are improvements to infrastructure, workforce education and the fight against corruption. However, the likelihood of such comprehensive reforms remains some way off as, within the Communist Party, there is a stand-off between the conservative and more reform-minded. The banking sector, which is dominated by five large state-owned commercial banks , is in bad shape. The sector is bloated in comparison to the size of the Vietnamese economy and nonperforming loans (NPL) are high (estimated at 10% to 15%), due mainly to politically motivated lending. The government has taken some steps to clean up the banks’ balance sheets, e.g. by setting up the Vietnam Asset Management Company to help recapitalise banks. As the sector is undergoing some restructuring due to the high NPL ratio, this could adversely affect performance in sectors like construction, steel/metals and finance. While a comprehensive restructuring of the banking sector still seems remote, any collapse is unlikely as the government would step in to rescue state-owned banks. 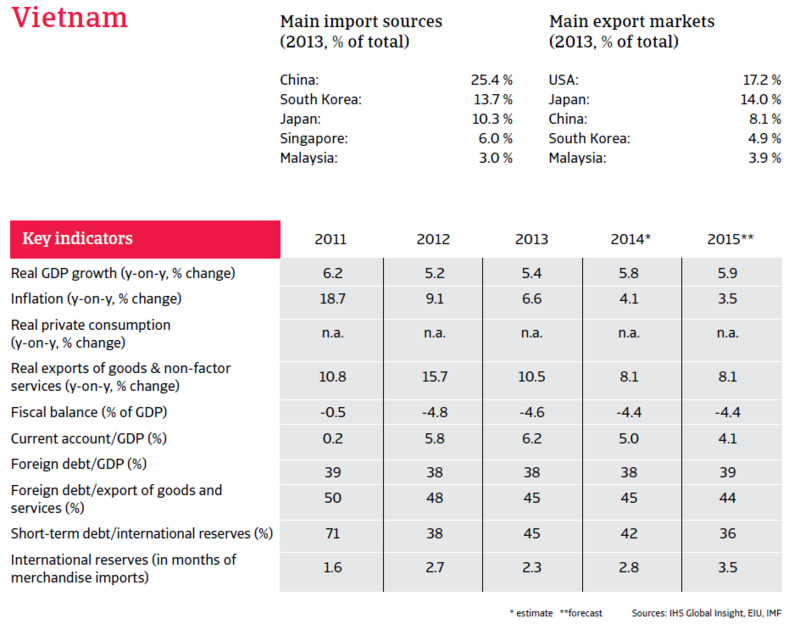 Vietnam has achieved a strong balance of payments, with solid current account surpluses, since 2012, together with high inflows of foreign direct investment (FDI). 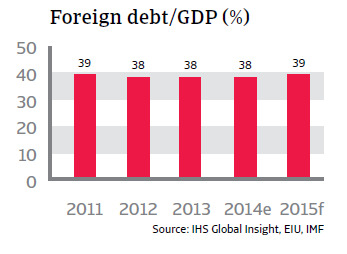 Foreign debt increased to 39% of GDP and only 45% of exports in 2014. Despite an expected increase in 2014 and 2015 (to 2.8 and 3.5 months of import cover respectively) import cover remains poor and liquidity shortages cannot be ruled out. However, given Vietnam´s limited international financial integration, there is little risk of sharp exchange rate devaluations. While the exchange rate remains pegged, some moderate devaluations are likely. The main challenge to profitability cited by our survey respondents in Singapore was “maintaining adequate cash flow”, at 31.7%.